The Big Joe Original is created it to do what other chairs before it could not it bends, it shapes, it even lies flat. Like bean bag chairs with a modern, grown-up twist. 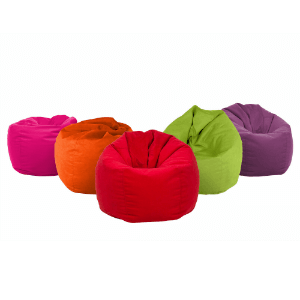 It is a sophisticated fusion of the love seat and the bean bag chair. One Seat Lounger from Sitsational Loungers Collection Dimensions: 43 In. W x 39 In. H x 31 In. D.
Jaxx Bean Pod. The coziest place to curl up and chill out is also a groovy seat for surfing the internet or doing homework. Jaxx Bean Pods are brimming with a polystyrene bead fill which makes them easy to flip, twist, turn, toss or stack. Excellent seating for smaller buns or smaller spaces, like dorms, studios and game rooms.Microfiber Collection: Black, Blue, Red, Purple and Tan.Duresist Collection: Royal, Khaki, Sky, Hunter, Stone, Orange, Ruby and Canary.Dimensions: 42 In. x 42 In. x 12 In.